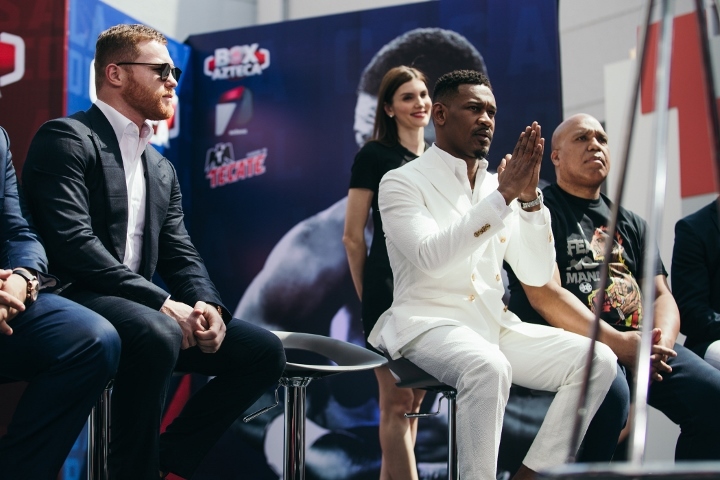 PORT WASHINGTON, N.Y. – Daniel Jacobs has made mental notes regarding all the talk of Canelo Alvarez and Gennady Golovkin fighting a third time in September. Jacobs wouldn’t be surprised if Alvarez and Golovkin go at it again. The IBF middleweight champion simply doesn’t think that fight will take place in September because Jacobs is convinced that he’ll upset Alvarez on May 4. Alvarez, who’s between a 4-1 and 3-1 favorite over Jacobs, would be entitled to an immediate rematch if the Brooklyn boxer beats the Mexican icon in their middleweight title unification fight two weeks from Saturday night at T-Mobile Arena in Las Vegas (DAZN). Jacobs discussed chatter regarding Alvarez-Golovkin III before an open workout Monday at Competitive Edge Athletics, the Long Island gym where he has trained for his fight against Alvarez. The 28-year-old Alvarez (51-1-2, 35 KOs) edged Golovkin by majority decision in their middleweight championship rematch September 15 at T-Mobile Arena in Las Vegas. Kazakhstan’s Golovkin (38-1-1, 34 KOs) and Alvarez boxed to an suspect split draw in September 2017 at T-Mobile Arena. The 32-year-old Jacobs (35-2, 29 KOs) wants his own rematch against Golovkin, who beat Jacobs by unanimous decision in a highly competitive 12-rounder two years ago at Madison Square Garden. First, however, he plans to take great satisfaction from defeating Alvarez, who won the WBA and WBC 160-pound championships from Golovkin.